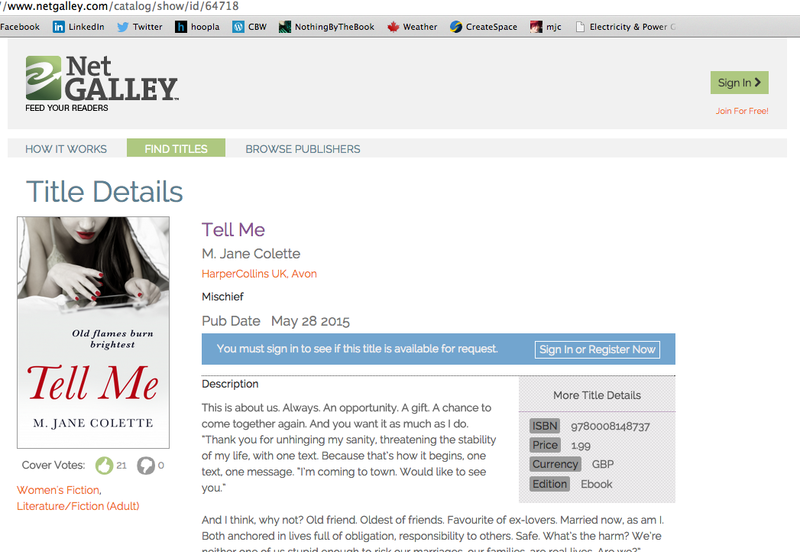 Tell Me by M Jane Colette on Net Galleys! This is about us. Always. An opportunity. A gift. A chance to come together again. And you want it as much as I do. As Jane “sexts” her lover and attempts to figure out how this aspect of herself fits into the obligations of marriage and motherhood, other relationships around her strain, fracture, and collapse. Her best friend is recklessly pursuing a series of cyber-affairs, while another friend attempts an open, polyamorous marriage. Her next-door neighbour is planning a wedding with her on-again/off-again lover—but will it really happen? Meanwhile her lawyer-husband is exchanging a lot of texts with an adoring young associate. Does Jane care? Or is she too engulfed in her own sanity-straining cyber affair to really notice?